A native Northern Californian, Alex began his career by apprenticing with Chef Walter Manzke in Carmel. He refined his culinary skills at The Little Nell in Aspen, regarded as Colorado’s premier luxury resort, working with Chef Ryan Hardy. Alex has traveled extensively in Russia and Western Europe, which has served to inspire his menus. 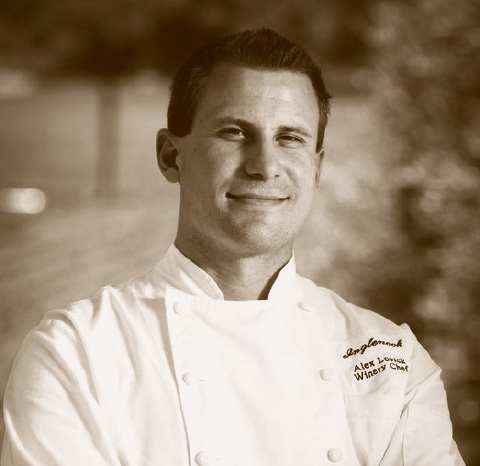 Since venturing to the Napa Valley, Alex has worked as a private chef for numerous clients, including the Nickel Family on their yacht, Far Niente. He has also worked at various wineries such as Kuleto Estate, Robert Mondavi Winery, and Stag’s Leap Wine Cellars.